There are two pressure points that cancel each other out with the hammer head acting as the counterweight. See, the head of the hammer wants to go down with gravity, and so it pushes up on the ruler. The ruler’s end wants to go down, but the hammer is keeping it up. The weight of the hammer keeps it pinned to the table, so there you go. Physics 101. They reinforce each other. when i was in 2nd grade i bought (and still have) a small playwood piece that balances on your finger (or on a shelf, etc) when using a belt as counterbalance. i wish i could explain this better, but i would bet that photo is of a ruler and hammer actually balancing each other. when i was in 2nd grade i bought (and still have) a small plywood piece that balances on your finger (or on a shelf, etc) when using a belt as counterbalance. 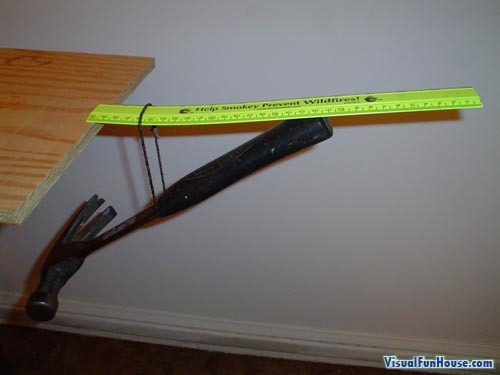 i wish i could explain this better, but i would bet that photo is of a ruler and hammer actually balancing each other.